Last week I finally bit the bullet and labeled the pictures I had taken so far in 2013. Well, not all of the pictures, only the ones I had not previously deleted. Without this filing process, it is difficult to find any particular picture when I want it. The use of metadata tags makes searching go much more quickly. This process also had the benefit that I got to view my pictures with a fresh eye and on a day when my philosophical hat was firmly in place. Here are a few that caught my attention and some of the thoughts I had about them. I stumbled upon this spider’s web on a morning walk in Savannah with our now-deceased golden retriever, Morgan. What intricate work the spider performed in order to eat. Some days later I sat and watched another spider construct its web. Similar to writers who spin stories, the spider started with the major frame lines and then filled in the details until the project was complete. It worked diligently until it was nearly finished, and after a short rest added a bit of filament here and there to fill in a few gaps in the story. Then it got out of the way and let the web do its work. I often forget that part and keep trying to improve something long after it has become fully functional. 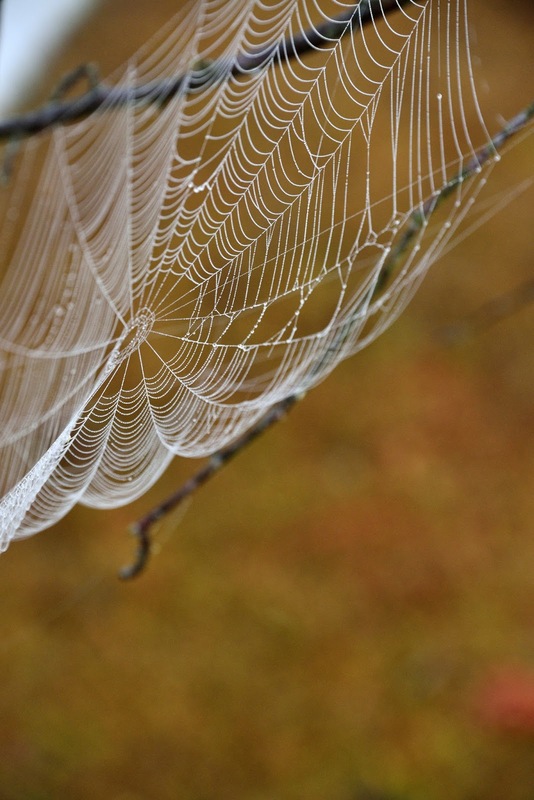 How ephemeral the first spider’s work was. A storm came through later that day and the next morning the web was gone. I was working in my Savannah study one morning when I spotted this male eastern bluebird outside. He flew from one lamp post to another warbling his bubbly song, letting the world know he was there and this was his territory. Sometimes it is necessary to take a risk and proclaim from a spot exposed to predator attack that this is yours and you are proud of it. Overdo it and a sharp-shinned hawk has you for lunch. Hide in a bush and you never get the girl. I wish I could figure out the right proportions when it comes to publicity for my writing. When we returned to our northern home, we discovered a beaver had decided to change the landscape in front of the house without consulting the local zoning laws and without a permit from the human owners. I suppose his motto was to ask forgiveness rather than permission. In any event, I was not about to go to a nursery and purchase a half-dozen sixty-foot trees, so I had to live with the change. 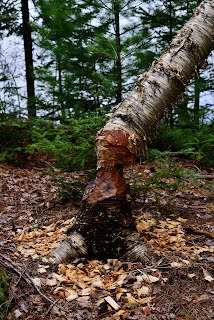 On this tree, the beaver worked hard, but got nothing because the tree didn’t fall to the ground; it hung up in other trees. 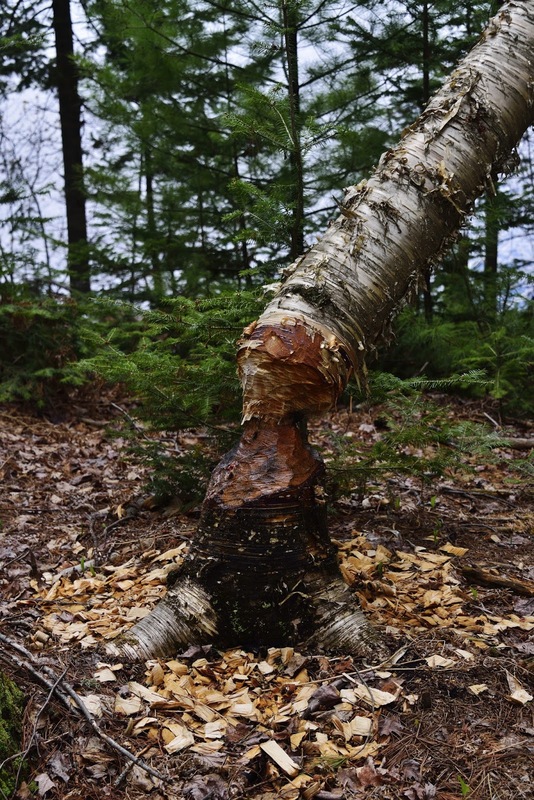 The beaver was successful with other trees, but not all work is productive. From my perspective, this tree was still dead and now represented only prospective firewood and a drop-on-my-head hazard until I completed the beaver’s work and took it to the ground. Only after I stopped being angry at the beaver’s decimation of my birch stand did I realize that by removing the trees the beaver had opened up my view of the lake (positive), opened up the view of my house from the lake (negative), and changed the amount of light reaching other trees and our house (positive if you are another tree, not so useful as the extra light heats up our house during the summer months). That reminds me of a story I tell on our neighbors across the lake: they took down many of the trees in front of their house to improve their view of the lake and then had to install blinds because of all the extra light they let in. As summer progresses, I notice the surrounding trees are reaching limbs into the vacated spaces, preferring to grow out rather than up. Most forest trees are lean poles as they grow straight up in their battle for light. These rare holes in the canopy allow for changed behavior. Humans, too, can experience new growth spurts when something causes an opening in their personal canopy. Unlike the trees, however, we can sometimes be our own beaver. 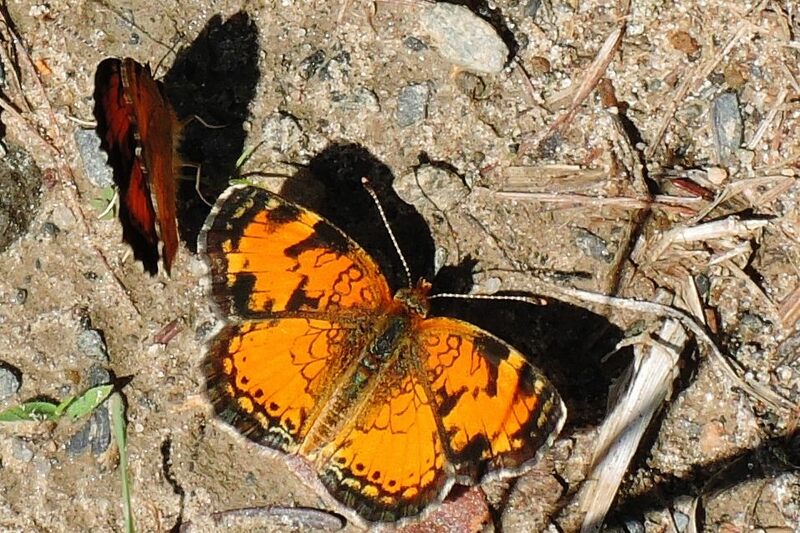 These two Northern Crescent butterflied gave me pause. The one on the left is freshly minted, whereas the one on the right is scarred with life’s travails. Lefty is more colorful and has its life mostly in front of it. Righty has more experience and to me is more interesting. How did it lose the edge of its left hind wing? Was it always less colorful or did the sun bleach out its colors? Did each of them perceive their own shadow, and what did they think about it if they did? I resemble Righty more than I usually care to admit. 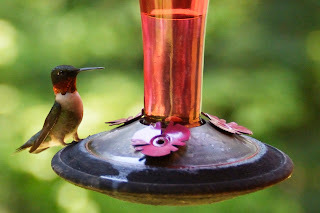 After the bear arrived two successive evenings and mauled our bird feeders, I now have to take in the hummingbird feeders overnight and put them out again each morning. The first birds up in the morning are my hummingbirds and an eastern phoebe that never tires of saying his name. Like this male ruby-throated hummingbird, the hummers not so silently wonder why I am sleeping in as they buzz their “flowers” and discover they are not yet there. 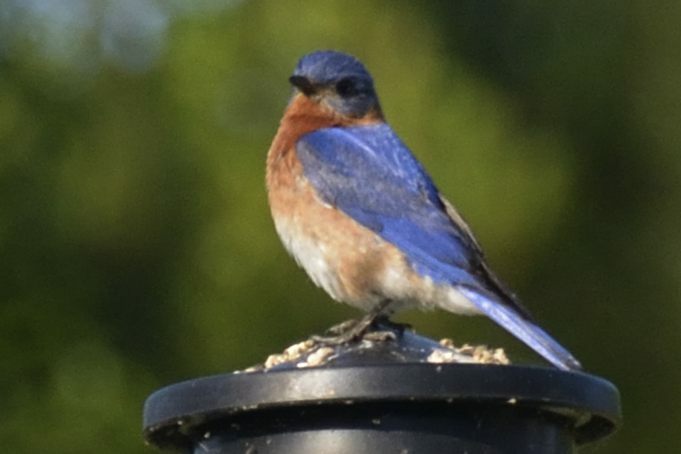 As soon as I awake, I put out their feeders; and I can’t go to bed until long after the sun goes down because they’re still being used. Since we are so close to summer solstice and I live above the 46th parallel, there is a lot of day between dawn and sunset—almost sixteen hours. The hummers arise in the predawn and retire after dusk. For me that requires a nap.